October 2016 – GIC news. Wikileaks Warns It Is Launching “Phase Three” Of Its Election Coverage. On Sunday night, Wikileaks enigmatically tweeted that it would launch “phase 3 of [its] US election coverage” in the coming week. The site put politicians on notice Sunday evening in a tweet that also included a plea for donations. “We commence phase 3 of our US election coverage next week. You can contribute: https://shop.wikileaks.org/donate @WLTaskForce” the whistleblower website announced moments ago. As the Hill noted, Wiki did not provide information about what the third phase entails or if there are still more revelations to come. As a reminder, Wikileaks’ founder Julian Assange currently finds himself in the Ecuador embassy where his internet access has been revoked for the duration of the presidential campaign to avoid the appearance of intervention. Wikileaks supporters, now including a number of disgruntled GOP nominee Donald Trump and Bernie Sanders supporters, promptly replied with tweets expressing hope that phase three would ultimately damage Democratic presidential nominee Hillary Clinton’s campaign. User “CorruptMedia” responded with a Photoshopped estimating what CNN coverage of Clinton being escorted to jail would look like. A new archive of Clinton-related documents would further irk a campaign still reeling from FBI director James Comey’s announcement on Friday that new emails related to the Clinton server probe had been discovered. But there is at least some reason to believe Wikileaks could release material that is not solely Clinton related. Julian Assange, the head of Wikileaks, has stated that he would publish information from Trump if the site were sent any. Author JollyBPosted on 31/10/2016 Categories USA News., Worldwide News. U.S. War Policy Has Created The Multi-polar World. As the United States squanders the enormous good will and respect it once had by marching forward on the tired legs of a dying empire, the U.S.’ enemies-of-its-own-making are beginning to forge new alliances that might not have been a reality had the U.S. at the very least pursued a strategy of positive reinforcement and cooperation as opposed to a policy of tension, pillage, and war. The first major crack in the iron curtain of the Anglo-American world hegemon started becoming apparent with the emergence of the U.S. destabilization and proxy war against Syria. While the NATO/American proxy war has left hundreds of thousands of Syrians dead, hundreds of thousands more displaced, and destroyed much of the Syrian infrastructure as well as crippled the Syrian economy, another result of American policy in Syria is that it has strengthened and even created alliances that otherwise may not have existed not only between Middle Eastern countries but European, Asian, and African nations as well. Unfortunately for the United States, these new alliances of its targets were created out of a political, economic, and military necessity by which to survive the Western onslaught of destabilization, sanctions, and war aimed at these respective nations. Thus, if the West wanted to break resistance to its hegemonic system, it has managed instead to encourage the opposite. While already an axis of mutual interest, the crisis in Syria has resulted in the strengthening of ties between Syria, Iran, and Hezbollah. Not only a strategic alliance, this arc of resistance has solidified ties that are slowly pulling Iraq away from the influence of the United States. Indeed, the Iraqis are still tethered to the United States due largely to bribery, deception, economic threats, and the decreasing dependency on the United States for military assistance to combat ISIS. Syria itself is spreading its wings as it mops up America’s terrorists. Reaching out to not only the nations of the resistance axis and Russia, it is reaching out and solidifying relationships with Russia and China as well as with other European and African nations like the Czech Republic and Egypt. Likewise, if the ties between Iran and the Houthis were not strong enough before the U.S.-backed, Saudi-led coalition, they certainly are now. Despite no credible evidence that Iran is providing weapons to the Houthis, there is little doubt that the Iranians are providing whatever support they can in whatever form that can take and that they will do so in the future. Russia, of course, factors in as the biggest and most important player in the strategic realignment with its insistence (which has come as a result of the U.S. aggression across the planet) in the emergence of a “multi-polar” world. Russia’s reunification with Crimea, support of the Ukrainian rebels, as well as its support of Syria is only the tip of the iceberg. A growing cooperation with China and with a host of other nations throughout the world – by virtue of the carrot as opposed to the stick – is rapidly drawing more and more nations into the Russian fold. Iran, too, having not expressed a desire for empire, nonetheless is now beginning to express interest in stretching its muscles and expanding its own influence. How much of this newly expressed desire is innate and how much is simply a necessary act of self-defense against and encroaching war machine that sees Iran as next in line for destruction is unclear. The fact that it is happening, however, is not in doubt. These new alliances may not have ever taken shape and solidified had the United States not insisted on acting as the battering ram for the Anglo-American system across the world and squandered all the respect and good will that existed for it in so many nations. The U.S. could easily have won many nations over by using positive reinforcement and enticement such as development, higher living standards, and peace. 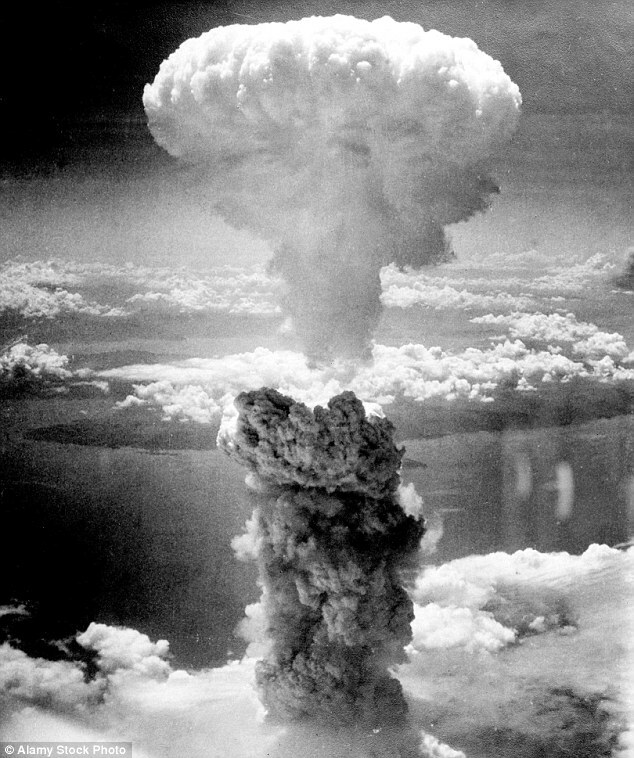 Instead, it has bombed, burned, bribed, and destabilized itself across the globe to the point that it has become the number one threat to world peace, a reality that is being acknowledged by more and more countries by the day. What could have been the greatest force for peace, stability, democracy, and high living standards has been utterly squandered into being the greatest force for the opposite. If the United States continues down this path of imperialism, it will soon find itself not only hated the world over, but collapsed, weak, and bitter while the nations it has targeted in the final days of its war push have united against it. We can only hope that they have more restraint, good will, and compassion than what the U.S. has shown to them. Author JollyBPosted on 28/10/2016 Categories USA News., Worldwide News. Dramatic video from the Dakota Access Pipeline protests, shows a full on assault by militarized police on peaceful people, including children and the elderly. Rise of the American Mercenary. A no-bid $10 million contract announced in late July is possibly the first instance in which the Pentagon has publicly acknowledged using private military contractors alongside American special operations forces fighting Islamic State in Syria. In a public announcement on July 27, the Department of Defense said it awarded an intelligence analysis contract to private contractor Six3 Intelligence Solutions, a cyber and signals intelligence and surveillance firm that is a subsidiary of CACI International Inc. The contract will require Six3 to assist US forces working against Islamic State (IS, formerly known as ISIS or ISIL) within Syria. Six3’s work pursuant to the contract will occur over the next year in Syria, as well as Germany and Italy, the Pentagon said. The DOD and CACI would not expand on the “intelligence analysis services” involved in the contract, The Daily Beast reported. According to US officials, there are about 300 US military special operations soldiers in Syria to “advise and assist” US allies fighting Islamic State, the militant group that holds territory in Iraq and Syria. In November, the Pentagon first announced that 50 US troops would operate in Syria. In April, the Obama administration said that around 250 more troops would be sent in “advisory” roles. The CIA has long operated and armed militants in Syria. While the Six3 contract is likely the first public acknowledgment of private contractors assisting the US in Syria, experts suggest it is probably not the only contractor involved. “I’ve long said, the military looks at professional services contractors like the old American Express commercial, i.e., they dare not leave home without them,” David Isenberg, a private security contractor analyst, told the Beast. Four weeks prior to the Syria contract announcement, the Pentagon revealed that it had awarded Six3 a $28.61 million contract to provide intelligence services to US forces in Afghanistan. CACI, the parent company of Six3, has been one of the top 30 contractors for the US government by amount of contract funds awarded in fiscal years 2012 through 2015. According to US military investigators, CACI employees were involved in interrogation and torture of prisoners held at Abu Ghraib prison in Iraq, more than a decade ago. Images of prisoner abuse at Abu Ghraib were released in 2004, becoming one of the biggest scandals associated with the US invasion and occupation of Iraq beginning in 2003. Operation Inherent Resolve is the name given to military’s operation to combat IS in Iraq, Syria, and beyond. As of July 27, the US-led operation had conducted a total of 14,093 airstrikes against IS targets in Iraq and Syria. Of that total, the US conducted 10,826 of the strikes, according to the Pentagon. From August 8, 2014, when airstrikes targeting the terrorist group began, to July 15, 2016, the operation has cost a total of $8.4 billion, or an average of $11.9 million a day. Author JollyBPosted on 27/10/2016 Categories USA News., Worldwide News. Russia unveils first image of its Satan 2 super-nuke that is capable of wiping out England and Wales and 2,000 times as powerful as the Hiroshima bomb. The new Sarmat missile could deliver warheads of 40 megatons – 2,000 times as powerful as the atom bombs dropped on Hiroshima and Nagasaki in 1945. 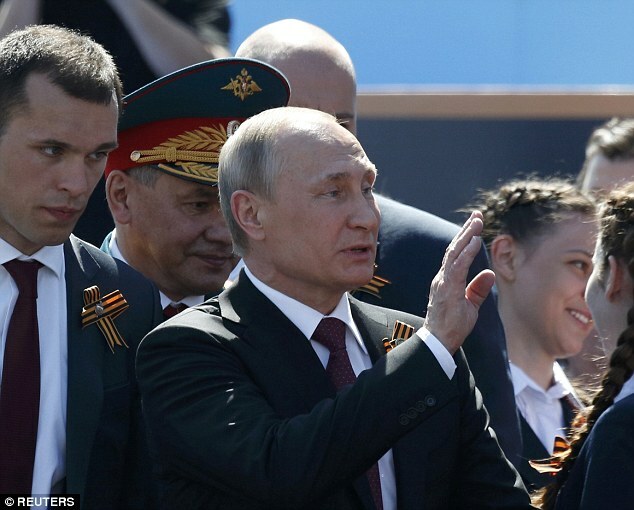 Scroll down for video Russian President Vladimir Putin is reportedly planning to replace the country’s older SS-18 Satan weapons with the new missiles amid a string of recent disagreements with the West. The Kremlin has stepped up the rhetoric against the West and carried a series of manoeuvres that has infuriated politicians in the US and UK. 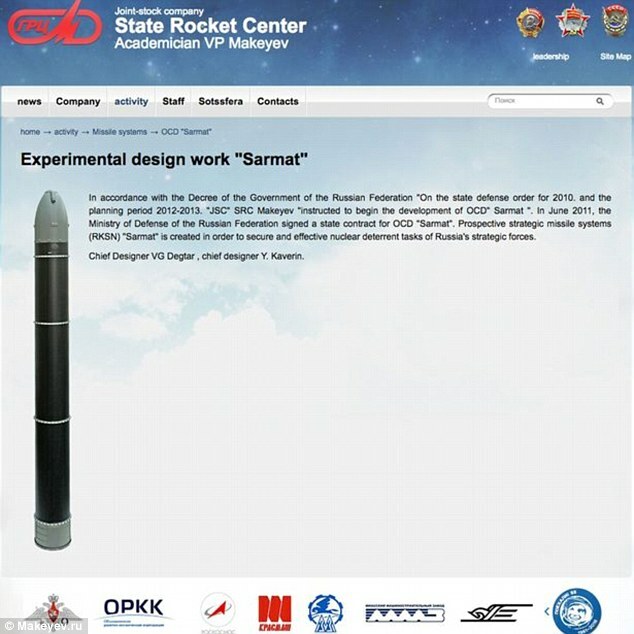 The pictures were revealed online by chief designers from the Makeyev Rocket Design Bureau. The RS-28 Sarmat missile is said to contain 16 nuclear warheads and is capable of destroying an area the size of France or Texas, according to Russian news network Zvezda, which is owned by Russia’s ministry of defence. 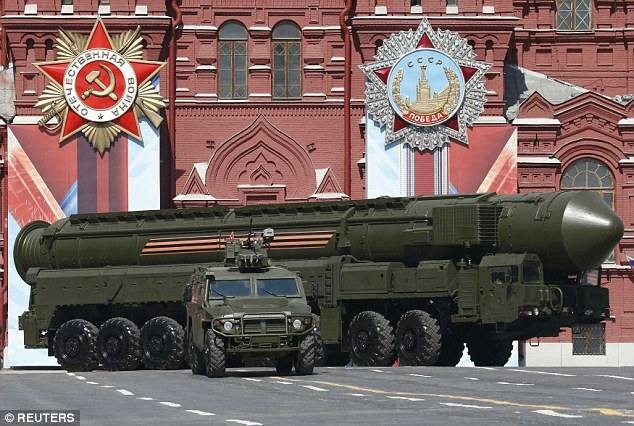 It is expected to have a range of 6,213 miles (10,000 km), which would allow Moscow to attack London and other European cities as well as reaching cities on America’s west and east coasts. Igor Sutyagin, an expert in Russian nuclear capability at the Royal United Services Institute in London, told MailOnline: ‘The SS-18 is more than 30 years old. It is past its sell-by date. ‘So even if you had the warmest relations in the world with Nato you would want to update your missiles. Each missile contains 16 nuclear warheads, according to pictures revealed online from the Makeyev Rocket Design Bureau. It is also able to evade radar. Dr Sutyagin points out that the SS-18 missiles which the Russians currently rely on were designed in 1988 during the Soviet Union and were built at a factory in Dnipropetrovsk, in what is now the Ukraine. 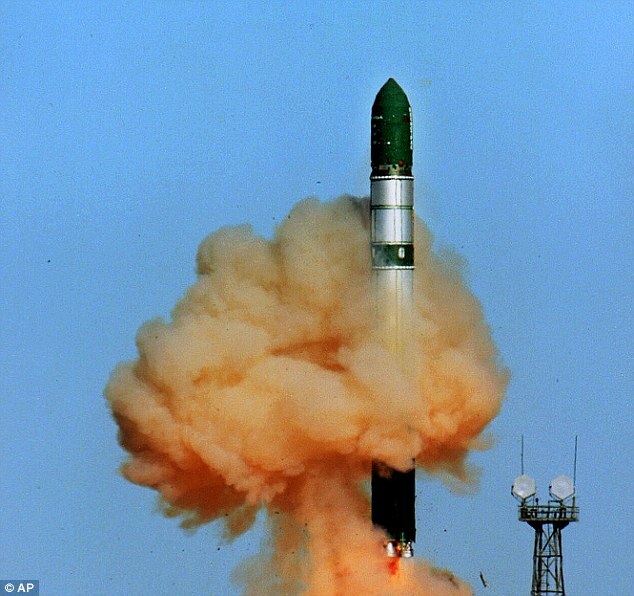 COULD RUSSIAN LAUNCH NUCLEAR ATTACK FROM SPACE? Russia is readying itself to become a leader in the construction of hypersonic aircraft, a new report reveals. Kremlin-backed media claim engineers in the Federation are among the first in the world to work towards new materials for planes capable of reaching hypersonic speeds. The move could help Russia produce a new fleet of aerial war machines that could launch nuclear attacks from space. Aviation researchers are reportedly working to develop the materials which can withstand the stress and high temperatures of travelling many times the speed of sound. He said the Russians cannot totally rely on the Ukraine-based maintenance engineers and he said Sarmat were designed and built by Russians at the Khrunichev plant just outside Moscow. Dr Sutyagin they would be no match for Nato systems like Aegis Ashore, the controversial missile defence shield which the US is deploying to Romania. 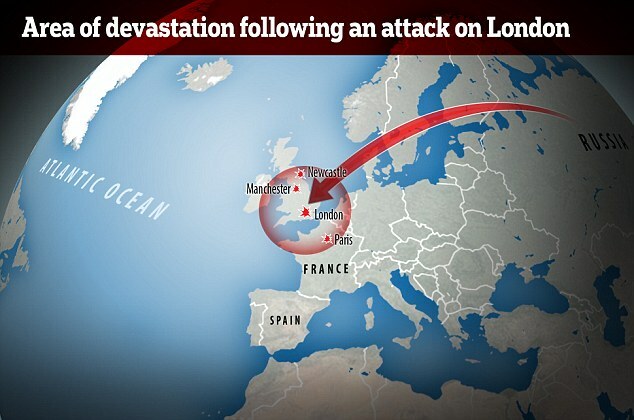 He said: ‘Not only are they too fast but they have got rid of the predictable flight path. The Russian Defence Ministry plans to put the Sarmat into service in late 2018 and remove the last SS-18 by 2020. The Sarmat has been in development since 2009 and is scheduled to start replacing the old ICBMs in 2018. The new missile is said to be undergoing testing near Miass in Russia. The tests are the latest in a line of policies and incidents carried out by Putin to antagonise the West. Western leaders have been quick to slap him down and accuse him of war-mongering. A fortnight ago, Hillary Clinton launched an open attack on Russia in a presidential debate, saying Vladimir Putin wants Trump to win and accused the regime of ‘war crimes’ in Syria. 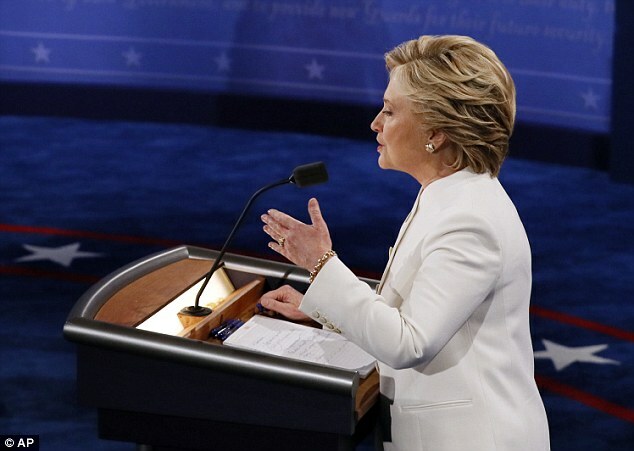 Clinton went on the offensive during the combative head-to-head showdown, apparently riled after she fell victim to leaks which she attributed to Russian hackers. In some of her strongest words yet aimed at Russian President Putin, Clinton rebuked the country for its bombing of Aleppo, home to some 250,000 people. ‘There is a determined effort by the Russian air force to destroy Aleppo in order to eliminate the last of the Syrian rebels who are really holding out against the Assad regime,’ she told the crowd. ‘Russia hasn’t paid any attention to ISIS. They’re interested in keeping Assad in power,’ she went on. ‘I do support the effort to investigate for crimes – war crimes – committed by the Syrians and the Russians, and try to hold them accountable,’ she told the crowd. She also alleged that Russia wanted to see Trump in power rather than her. ‘But I want to emphasize that what is at stake here is the ambitions and the aggressiveness of Russia,’ she said. The FBI said in July that it was looking into the hacking of the Democratic National Committee computer system, after WikiLeaks published nearly 20,000 internal emails on the eve of the party’s convention. The recent criticism has clearly rubbed Putin up the wrong way, who reacted today by saying: ‘If somebody out there wants confrontation this is not our choice but this means that there will be problems,’ according to The Mirror. 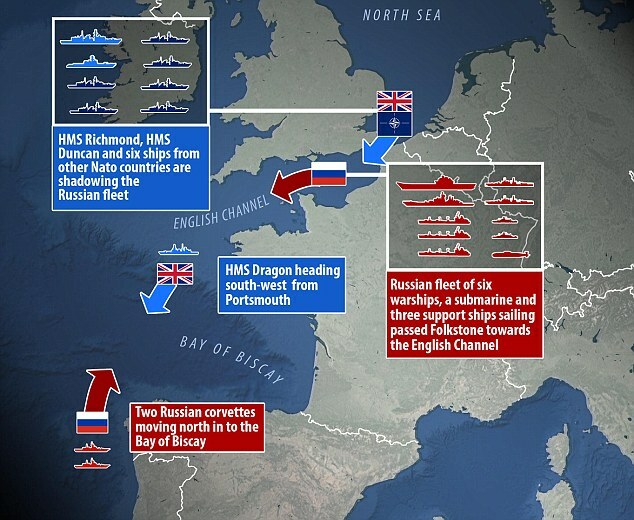 Last week, the Royal Navy was forced to deploy its vessels as Russian warships chugged through the English Channel on their way to the Mediterranean. The fleet is heading for Syria could be used to target civilians in the besieged city of Aleppo, NATO Secretary-General Jens Stoltenberg warned on Tuesday, calling on Moscow to implement a lasting ceasefire. NATO is monitoring the movement of the eight-strong carrier battle group from northern Russia towards Gibraltar en route to the eastern Mediterranean, where alliance officials fear it will launch fighter bombers to hit northwestern Syria early in November. ‘The battle group may be used to increase Russia’s ability to take part in combat operations over Syria and to conduct even more air strikes against Aleppo,’ Stoltenberg said. ‘The concern is that the carrier group can be used as a platform for increased air strikes against civilians in Aleppo,’ he told a news conference, calling for a halt to all bombings. 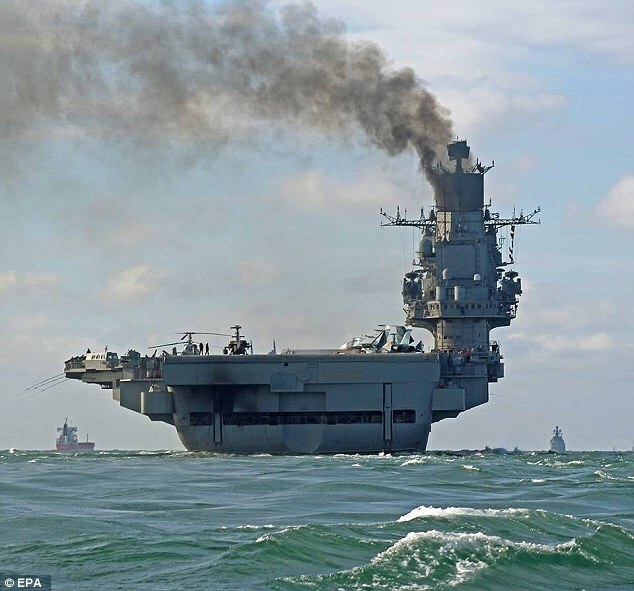 The naval group, which passed through the English Channel on Friday, is made up of Russia’s only aircraft carrier Admiral Kuznetsov, as well as a nuclear-powered battle cruiser, two anti-submarine warships and four support vessels, likely escorted by submarines, NATO officials said. The naval deployment, a rare sight since the end of the Soviet Union, is carrying dozens of fighter bombers and helicopters and is expected to join around 10 other Russian vessels already off the Syrian coast, diplomats said. The White House and the Kremlin have been at loggerheads for weeks over the Syrian civil war with the US backing rebel groups attempting to overthrow the government and Putin supporting President Assad. Both have accused each other of air strikes on aid convoys and civilians. Though the Russian military said Tuesday the weeklong halt of Russian and Syrian air strikes on the besieged city of Aleppo will continue and humanitarian corridors will remain open even as the Syrian army has unleashed a new offensive on the rebel-held neighborhoods. As well as a bulging stock of nuclear missiles in Russia itself, Putin is looking to flex his muscles around the world. Russia is considering reopening military bases in Vietnam and Cuba as Putin looks to assert his army’s presence around the world. Bases in those countries served as pivots of the Soviet global military power during the Cold War. Now, the Kremlin looks set to plot a return Russian news agencies quoted Russian Deputy Defence Minister Nikolai Pankov. Egypt too is said to have accepted Russian military bases. Author JollyBPosted on 27/10/2016 Categories Worldwide News.